Each educational stage has some specifications, which are reflected in both job requirements, and in the hiring process for the position of a teacher. Standing somewhere on the way between elementary and high school, students can choose some subjects while studying in the 5th, 6th, 7th, 8th and sometimes even the 9th grade. But does this change anything for you, as a teacher? For sure it does. First of all, we talk about children aged from 11 to 16, which happen to be the most problematic teenage years. Children start to struggle with discipline at a middle school, and they often experience emotional and mental difficulties. Generally speaking, teaching 7th graders is definitely more challenging than teaching 3rd graders. On the other hand, teaching is teaching. Most of the questions in your interview will be the same, doesn’t matter if you apply at elementary, middle, or high school. And a good answer in one case will work also in another one. There are just slight differences, and we try to refer to them in this article. Special Tip: For a full list of interview questions for teachers, however, you should refer to our Teacher Interview Questions article. Why middle school? Why not elementary or high school? What teaching methods do you prefer with middle school students and why? What are the challenges middle school teachers experience in the classroom? What are the current trends in Mathematics (Physics, Chemistry, Literature, History)? You have a few options to explain your choice. You can say that you enjoy working with this particular age group, that you understand their world and challenges they experience, and therefor you prefer to work with them, and not with younger students. Another alternative is to say that you like to focus on your main subject (Math, Physics, History, anything), and believe that the value you can convey to the students in the lessons is higher at Middle School, since students choose their subjects, and the classes are typically smaller. Expectations are higher, and the discipline lower. Traditional lecturing won’t make much impression on a typical 8th grader. Tell the hiring committee that you prefer more student-oriented teaching methods, such as game-base learning, discussion, inviting guests to talk in the classroom, inquiry based learning, etc. The key is to demonstrate your willingness to step out of your comfort zone for the students, in order to maximize the potential of your lessons. 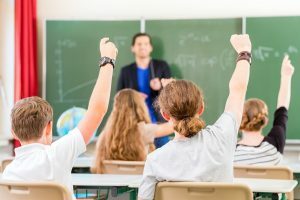 Problems with discipline, little interest in study, social media addictions, inability to motivate the students, and changing moods of the students are just of the few challenges that prevail in a middle school classroom. Feel free to add more to your answer, based on your experiences and observations. One important thing to remember: Do not get discouraged by the challenges. Teaching is not an easy job, but your goal is to try to convince the hiring committee that you are ready to try to address the challenges with smile, though your efforts may end up in vain. That’s just how it goes, and a good candidate for any teaching job understands it. Teaching at the Middle School, you will typically specialize only in one or two subjects. Try to show the interviewers that you keep your knowledge up to date. Check the latest trends, read something about teaching methods, and get ready for this question. You can even tell them that you attend conferences and events for teachers, to stay on the top of the game. Maybe you attended just one conference, and it happened five years ago. Nevertheless, you can still mention that you go to conferences. As we pointed out at the beginning of the article, most questions (and good answers to them) won’t differ from one educational stage to another. Check our principal article for Teacher Interviews to get ready for your interview at a Middle School.